Meredith, how do you choose your preamps? I mean, I said, this is what we're doing today. These are your available preamps. How do you choose? It all depends, every instrument and situation is different. But, for example, I know that the UA stuff is warm and tubey and sounds great on bass. That's pretty much a go to every time for me. You know that from experience? Yes. Ah, experience. Isn't that a beautiful thing? All you come to Sweetwater seminars, now you know that UA stuff sounds great on bass. Right. It depends on the bass player, It depends on your microphone. And also depends on what you had for breakfast that morning. We have to make sure that you form your taste. Everything is about forming your taste. So you gotta try it. Succeed or fail. If you fail try something else. If you succeed, well try something else still. Just so that you don't die with just one solution for every problem. That's a good thing, you know that the UA stuff is warm on bass. Great! How else? The Great River stuff I know is just really clean and open sounding. It's awesome on overheads if you have a great sounding kit. There's also, you know, depending on features. What you need. 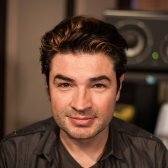 Do you need an EQ, do you need a compressor? On a specific instrument that might determine your mike - pre choice. So you mean that's not just sound, there's functionality too. So for example, on the snare. We use the Great River on the snare. We did that why? We did that because we wanted to, I guess we wanted to hi-pass it. We wanted to have a hi-pass filter. We wanted to have a hi-pass filter so it's taken care of. Because tomorrow I'm gonna mix this song in one hour. And it's not like I'm gonna be able to like leisurely stroll through the process. Might as well prepare the tracks and make them sound as good as possible. 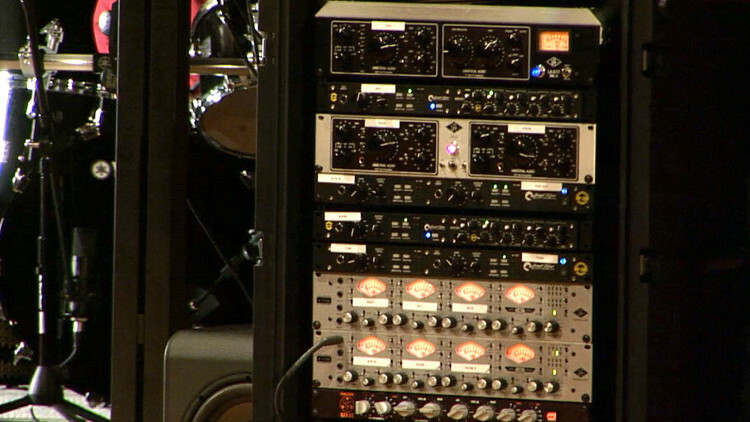 So we looked at the preamps to see which ones have a hi-pass filter. Which one sounds great on bass? We know that the LA 610, or the two 610s sounds great on bass. So we put that one to bass. If we need a hi-pass on the bass we probably would have switched. The idea here is also to get evenness between the instruments. The two bass drum microphones are going through the Great River. That's a matched stereo pair. Because we know it's a fast preamp. It's got fast transient so we will get that boom. It also has a polarity switch on it. We used the new 4710 on the overheads. Because it has an 1176 style compressor and it sounds really great. So, we like to have a little bit of compression on the overheads because A, it's fun. And two because we can. That's why we choose that one. Now, I need a singer. Preferably British, preferably with a dry sense of humor. Oh this one over there. You sir. OK, that was for the drum set. Any questions? Yes. Why not? All Mojave condensers. Do you want me to put the screen back on? There was another question. Yes sir. It depends on what you're doing. If the Timur was banging on the snare like crazy. You know how to do that, right? Yes, but he chooses not to. If you were hitting the snare really hard, then I probably would put a 57 there. Just to try and tame those transients. Because the 57 is not a high resolution microphone no matter what Shure says. The wonderful thing about it is that it filters what goes into the recording. The transients are not getting through the same as on a condenser. You don't want the super detail. So you put a less detailed microphone and it helps you out. In this particular case for room mike with have and SF 24. Royer SF 24 V here as a room mike. screen right now. It's right by here. For this kind of stuff I would have a room mike around the drums if I have good isolation. In this particular case there's no isolation. I can hear you guys sneeze into the the overhead microphones. Do you know what I mean? A room mike is good to create kind of a bit of a mess. A little bit of buoyancy. I make a lot of records for other producers too, I see a lot of people who record 16 tracks of drums with like: far room, high room, low room mono room, two blum, room through a compressor. Just put two microphones somewhere it sounds OK.
Don't go crazy on the rooms. When you have 100 tracks on your mix the far compressed left room thing tends to get select, "tic to". How about the right one? All we went with. It's only so many tracks you can handle. OK, let's move on to vocals. How many of you have tried to record somebody who sings and plays guitar at the same time?